TV show dates: August 10, 2017 — August 24, 2017. Performers include: Colin Jost and Michael Che. A satirical news series, the Saturday Night Live: Weekend Update Summer Edition TV show is a half-hour primetime presentation of the weekly Saturday Night Live “Weekend Update” segment. Jost and Che serve as anchors, just as they do on the parent show. Other SNL cast members also appear on the program. Following in the footsteps of “Weekend Update” anchor Chevy Chase — who created the segment — as well as notable anchors including Dan Aykroyd, Jane Curtin, Dennis Miller, Norm Macdonald, Jimmy Fallon, Tina Fey, Amy Poehler, and Seth Meyers, Che and Jost offer the primetime audience a comedic look at the week’s events. In 2008, Amy Poehler and Seth Meyers anchored the primetime show, Saturday Night Live Weekend Update Thursday, in the month prior to the US Presidential election. It returned for three episodes in the fall of 2009, with Poehler and Meyers hosting the first two episodes, and Darrell Hammond and Maya Rudolph serving as anchors in the third. Two episodes, listed as SNL Primetime Election Special, also aired in September of 2012. Sketches include Trump Phoenix Rally Cold Open. Update Topics include: Trump Staring at Sun, Arizona Rally, Blacks for Trump, New Strategy, Covering Statues, Broadcaster Reassigned, Boy Delivers Baby, Tiger Nudes, Running for Congress, Dog Honored (Guests include Pete Davidson on Colin Kaepernick, Alex Moffat as Conor McGregor, Mikey Day as Where’s Wes, and Cecily Strong as Cathy Anne). What do you think? 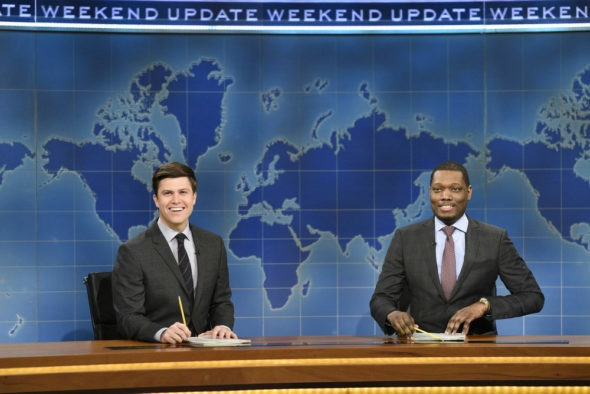 Do you like the Saturday Night Live: Weekend Update Summer Edition TV series? Should this TV show have been cancelled or renewed for a second season on NBC?